(Nanowerk News) For all the challenges posed by the microgravity conditions of space, weight is actually one of the more significant problems NASA faces in the development of the next generation of U.S. space vehicles. For the Agency’s Constellation Program, engineers at NASA centers are designing and testing new vessels as safe, practical, and cost-effective means of space travel following the eventual retirement of the space shuttle. Program components like the Orion Crew Exploration Vehicle, intended to carry astronauts to the International Space Station and the Moon, must be designed to specific weight requirements to manage fuel consumption and match launch rocket capabilities; Orion’s gross liftoff weight target is about 63,789 pounds. Future space vehicles will require even greater attention to lightweight construction to help conserve fuel for long-range missions to Mars and beyond. In order to reduce spacecraft weight without sacrificing structural integrity, NASA is pursuing the development of materials that promise to revolutionize not only spacecraft construction, but also a host of potential applications on Earth. Single-walled carbon nanotubes are one material of particular interest. These tubular, single-layer carbon molecules—100,000 of them braided together would be no thicker than a human hair—display a range of remarkable characteristics. Possessing greater tensile strength than steel at a fraction of the weight, the nanotubes are efficient heat conductors with metallic or semiconductor electrical properties depending on their diameter and chirality (the pattern of each nanotube’s hexagonal lattice structure). All of these properties make the nanotubes an appealing material for spacecraft construction, with the potential for nanotube composites to reduce spacecraft weight by 50 percent or more. The nanotubes may also feature in a number of other space exploration applications, including life support, energy storage, and sensor technologies. NASA’s various efforts with carbon nanotubes have made it a global leader in this field. Among the many examples are Johnson Space Center’s Carbon Nanotube Project, which focuses on bulk nanotube production, purification, and application, and Goddard Space Flight Center’s improved arc discharge method of nanotube production, developed under the direction of Jeannette Benavides. While the Agency continues its own research, it partners with private companies to advance this unique technology for use on Earth as well as among the stars. One of the significant challenges involved with taking advantage of single-walled nanotube technology lies in how the nanotubes are made. Typical manufacturing methods are expensive, are not amenable to large scale production, and can be inefficient, resulting in samples containing as low as 10–15 percent nanotubes. Costly and time-consuming separation procedures are needed to sort out nanotubes of the desired diameter, length, and chirality. In addition, nanotube samples can be tainted with residual catalyst impurities and common byproducts like amorphous carbon and graphite nanofibers. Thus, affordable, largely pure nanotube supplies with tailored properties for research and commercial efforts have been lacking. 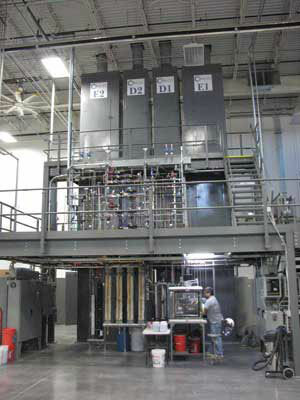 By increasing the size of its fluidized bed reactors, seen here, SouthWest NanoTechnologies Inc. (SWeNT) increased its carbon nanotube production capacity while at the same time lowering cost. To address these issues, Johnson awarded Phase I and II Small Business Innovation Research (SBIR) contracts to SouthWest NanoTechnologies Inc. (SWeNT), of Norman, Oklahoma, to pursue the development of a new nanotube production method. Founded in 2001, SWeNT is the offshoot of landmark research conducted by Daniel Resasco at the University of Oklahoma. Resasco pioneered a controlled catalytic method for creating nanotubes that is inherently scalable for mass production. During Resasco’s cobalt-molybdenum catalytic procedure—known as the CoMoCAT process—pure carbon monoxide (CO) flows through suspended cobalt and molybdenum catalyst particles in a device called a tubular fluidized bed reactor. At certain temperatures and pressure, the nanotubes are grown as the CO decomposes into carbon and carbon dioxide. By controlling the conditions and catalyst within the reactor, Resasco was able to grow significant, highly selective amounts of high-quality nanotubes within a couple of hours. Using the NASA SBIR funding, SWeNT demonstrated that increasing the size of the fluidized bed reactor platform increased production capacity while decreasing cost. The SBIR support also provided another welcome outcome: higher quality nanotubes. In 2008, SWeNT opened a commercial-scale nanotube manufacturing plant. Since beginning operations at the 18,000-square-foot facility, Arthur says, the company has experienced a hundredfold increase in production coupled with a tenfold reduction in cost. SWeNT now offers two single-walled carbon nanotube product lines, as well as customized orders for the company’s hundreds of customers. 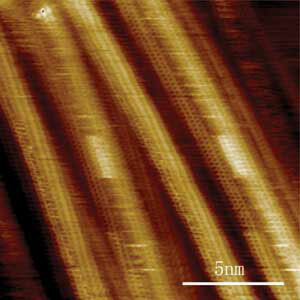 This image of SWeNT’s single-walled carbon nanotubes reveals the hexagonal lattice sidewall structure of the nanotubes. The pattern of this structure plays a role in determining the nanotubes’ properties. Those production methods are the key to increasing output while lowering cost, Arthur notes. By controlling nanotube synthesis, SWeNT can selectively grow the nanotubes its clients want while avoiding an expensive, wasteful, time-consuming, and non-scalable sorting process. Using the CoMoCAT process, the company delivers nanotube orders that are routinely 95 percent carbon in composition, with more than 90 percent of that carbon in the form of nanotubes—all above typical industry outcomes. SWeNT’s controlled synthesis capabilities have allowed it to provide customers with customized nanotubes for a wide range of new and developing technologies. The company has supplied diameter-specific nanotubes for use in reinforcing carbon fibers, with the potential to yield a material 17 times stronger than Kevlar for use in bulletproof body and vehicle armor. It is working with aerospace and nanomaterials clients to produce chirality-specific nanotubes—the goal, Arthur says, is to create the most electrically conductive carbon nanotubes in the world—for nanocomposite cable wiring to replace standard metal wiring in commercial aircraft. The company is exploring the use of its semiconducting nanotubes in the form of an ink, enabling the production of low-cost, printable electronics; applications include radio frequency identification, biological and chemical sensors, and electronic displays. Arthur foresees SWeNT nanotubes also enabling more affordable solar photovoltaic panels and solid-state lighting products that could have a dramatic impact on energy consumption. SWeNT has set its sights on expanding its capabilities to also produce small-diameter, multiwalled carbon nanotubes for niche electrical applications, as well as building on its current single-walled nanotube success. “Our vision is to once again increase our production scale a hundredfold and enjoy another tenfold reduction in cost,” says Arthur. At that point, he says, the company can even further reduce costs by recycling the CO feed gas used in the synthesis process—its most expensive production material. SWeNT’s NASA SBIR-enabled CoMoCAT process is receiving notice from beyond its customer base. The company received a 2007 “Tibbets Award” for excellence in SBIR achievement, and last year the National Institute of Standards and Technology designated SWeNT’s SG65 single-walled carbon nanotubes as a starting material for developing a carbon nanotube Standard Reference Material. These reference materials are employed by industry, academia, and government as standards for commerce, trade, and research and development.